Number is ... (3-in-1) - NEW! This printable number recognition worksheet generator teaches children to recognize numbers, shapes, and colors, and write the numbers and their corresponding words and shape or color. 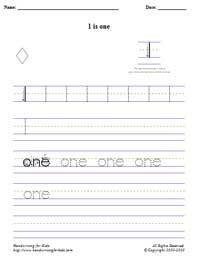 The worksheet is available in the following languages: English, and Spanish. Coming Soon: French, and Italian! Select language: English, or Spanish. Select Picture Theme from drop-down list. Select Number Range: 0 through 10. See example sheet on the right or view a sample page.